Granite countertops are increasingly popular, popping up in kitchens all around Annapolis, MD. They give a kitchen a classy look and can seriously increase the value of a home. Adding the right sink to your granite will bring your kitchen to the next level. Learn how to properly fit your granite countertops for a sink and ensure your new kitchen plumbing runs smoothly. 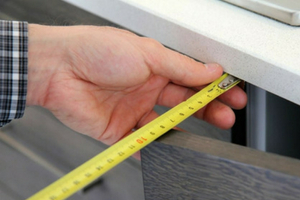 Before cutting the hole for the sink, do the proper measurements on the countertop. Allow enough space for the kitchen plumbing underneath the countertop and ensure it is placed in a practical spot. Tape the cardboard outline of your sink onto the granite, then cut. For cutting granite, use a diamond blade on a circular saw. This tool is best not just for cutting, but shaping your stone as well. Once the opening has been made, you can flip your granite over and get ready to insert the sink. Your sink should match the design of your kitchen. So, allow for enough space for the plumbing and storage underneath. Now that your granite is cut and flipped, you can secure your sink. Wipe your granite and sink with denatured alcohol, and then place the sink over the hole to trace. Once traced, remove the sink and apply caulk to the edge of the hole. Place the sink back over the hole and press down. Seal the sink in place using the clamps provided with your sink purchase. Now you can turn your countertop back over to install them. Would you take your car to anyone who wasn’t a licensed mechanic? No, probably not. So why try installing your kitchen plumbing on your own if you’re not a plumber? Professional plumbers have expertise that the average homeowner simply doesn’t. Education and experience can’t be beaten. 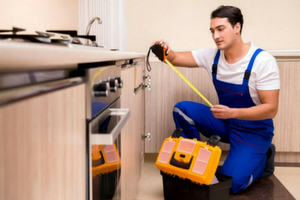 If you’re investing significant amounts of time and money to make changes to your kitchen, then you might as well consider professional installation by a plumber who will execute the task correctly. New kitchen features are always great to look at. In addition to being eye-catching, upgrading your kitchen will add value to your home if you ever decide to sell it. Two birds, one stone!